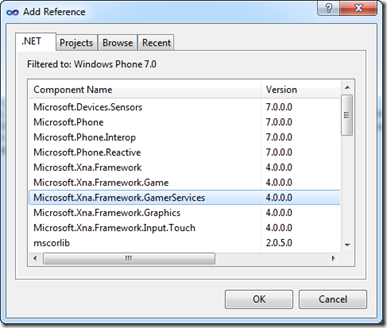 Building a better MessageBox for WP7 with the help of XNA. 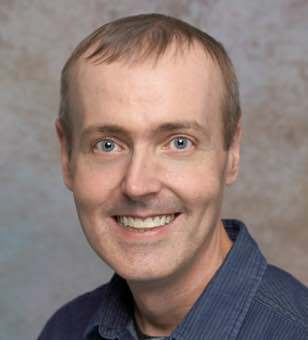 I’ve recently had the requirement to allow my user to choose between two items in my Windows Phone 7 application. The first way that I thought of tackling this was using the standard MessageBox.Show that is included with the System.Windows class and seeing if the enum provided a way to allow custom text. Kinda boring and doesn’t allow any real customization. But what if we wanted to display custom text where the ok and cancel buttons are? What if we wanted our application to look like the following? This is where we could use a little help from XNA libraries. 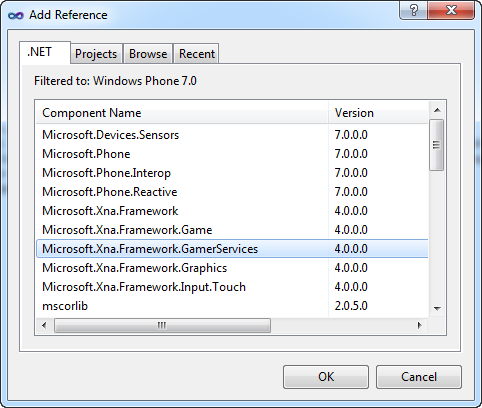 Go ahead and open your Windows Phone 7 Project and right click on References and select Microsoft.Xna.Framework.GamerServices as shown below. In this example I added a Button and am simply changing the PageTitle.Text to be whatever you selected. As you can see this code is pretty simple and the only thing you may be confused about is the Deployment.Current.Dispatcher.BeginInvoke() call. The reason that this is in here is because without it is is an Invalid cross-thread access as shown below. Thanks again for reading and hopefully this bails someone out like it did for me.